The largest budget passenger airline Ryanair on September 3 launched its first flight from Ukraine to Berlin (Schönefeld) from Kyiv (Boryspil International Airport). The first flight of the new route from Berlin to Kyiv was 95% full, and 100% full from Kyiv to Berlin, Ryanair's Sales & Marketing Deputy Manager for CEE & Balkans, Denis Barabas, has said. 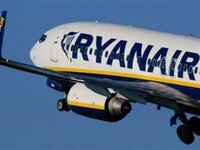 Ryanair will service the route four times a week. Commenting on the launch of the new flight, Ukrainian President Petro Poroshenko said on Facebook that the Kyiv-Berlin route is "one of the 12 routes, which the airline will manager in the autumn-winter period," and that Ryanair plans to fly 635,000 passengers. "This shows the visa-free regime with Europe Ukrainians waited so long far is working successfully. About 1,290,000 Ukrainian citizens have visited Europe since it began working," the president said. Taking into account the flight to Bydgoszcz (Poland), Ryanair offers flights from Kyiv to six Polish cities, one destination in Germany, Spain, Lithuania, Slovakia, the United Kingdom and Sweden each, as well as two flights from Lviv to Germany and Poland, and one to the United Kingdom.